Before going through exception handling in JSP, let’s understand what is exception and how it is different from errors. Exception: These are nothing but the abnormal conditions which interrupts the normal flow of execution. Mostly they occur because of the wrong data entered by user. It is must to handle exceptions in order to give meaningful message to the user so that user would be able to understand the issue and take appropriate action. Error: It can be a issue with the code or a system related issue. We should not handle errors as they are meant to be fixed. We can handle exceptions using the below two methods. In the below example – we have specified the exception handling page using errorPage attribute of Page directive. If any exception occurs in the main JSP page the control will be transferred to the page mentioned in errorPage attribute. The handler page should have isErrorPage set to true in order to use exception implicit object. That’s the reason we have set the isErrorPage true for errorpage.jsp. 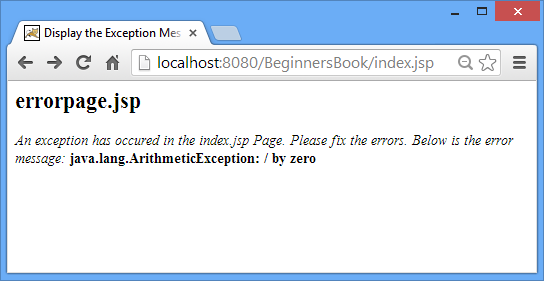 <i>An exception has occurred in the index.jsp Page. We have handled the exception using try catch blocks in the below example. Since try catch blocks are java code so it must be placed inside sciptlet. In the below example I have declared an array of length 5 and tried to access the 7th element which doesn’t exist. 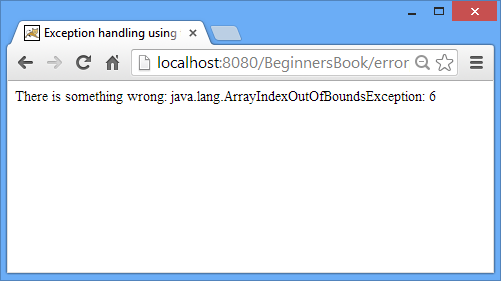 It caused Array Index out of bounds exception. Let us know which method do you prefer for handling exceptions and why. If you have any questions, feel free to drop it in the below comment section. I cant understand actual difference of jsp and servlet ? we use these technologies seperately or in combine? i prefer to use the exception implicit object method instead of try catch block in scriptlet. because scriptlet is not recommended from long ago as per your previous topics explanation.